Our focus is the physical division of races and ethnicity in geographical areas of North, West, and South Omaha. The best and simplest platform to show “Race and Ethnic Divisions in Omaha, Nebraska” would be through the use of images. Specifically, images searched on Google Images. The images used were put into four categories: People, Business, Domestic, Events. The first image pertaining to each category was used. This would essentially help take away any immediate objectivity into picking the pictures from any member of the group. The images were searched on 11/16/2015. 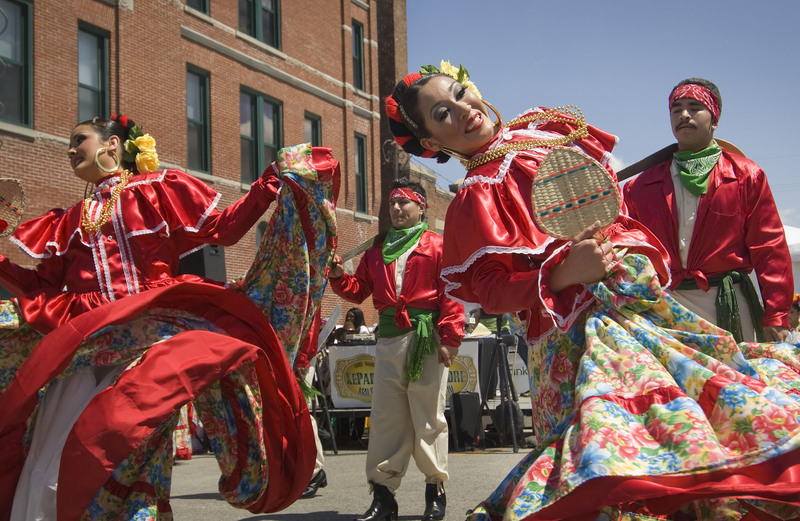 In image A we see a group of Hispanic Americans dressed in colorful traditional clothing, taking part in a Cinco de Mayo festival which is held on 24th Street, south of L Street each year. In this area of Omaha we can clearly see that Hispanic culture dominates and hispanic americans are mostly centered in this part of town with this being the first image to represent the people of South Omaha. Image B is interesting in the way that the reaction is seemingly large, and almost too exaggerated being that there are almost 20 firefighters reacting to the scene of a contained garage fire that was most likely reported immediately, seeing that it took place in the middle of the day. The home owners in this image are caucasian, also all of the men that aren’t in uniform are caucasian (for those in uniform it is impossible to tell their race/ethnicity from the picture) confirming the idea that West Omaha is dominantly caucasian and there is little racial or ethnic diversity in the area. The result for people of North Omaha presented us with a picture of 4 African American males dressed in similar urban fashion, standing in the middle of a neighborhood street (Image C). 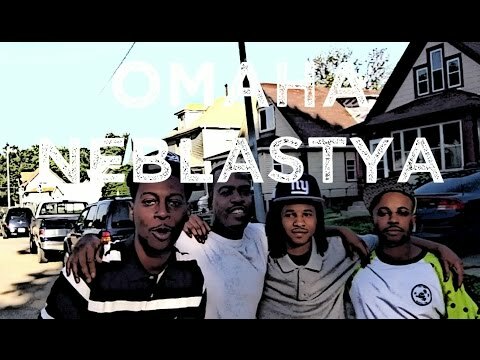 When you click on this photo on the Google page it actually sends you to a Youtube video that the young men in the photo made about the neighborhoods of North Omaha. The video features all African American males, most of which are representing gangs and speaking about crime in the area, confirming the stereotype that this area of town is associated with heavy gang and criminal activity. This may be the reason for stereotypes formed about African Americans committing crimes since the African American population is largely apparent in this area of town where there is also high crime rate, even if the majority of people committing the crimes aren’t African American people still make this association because both are greatly centralized in this part of Omaha. 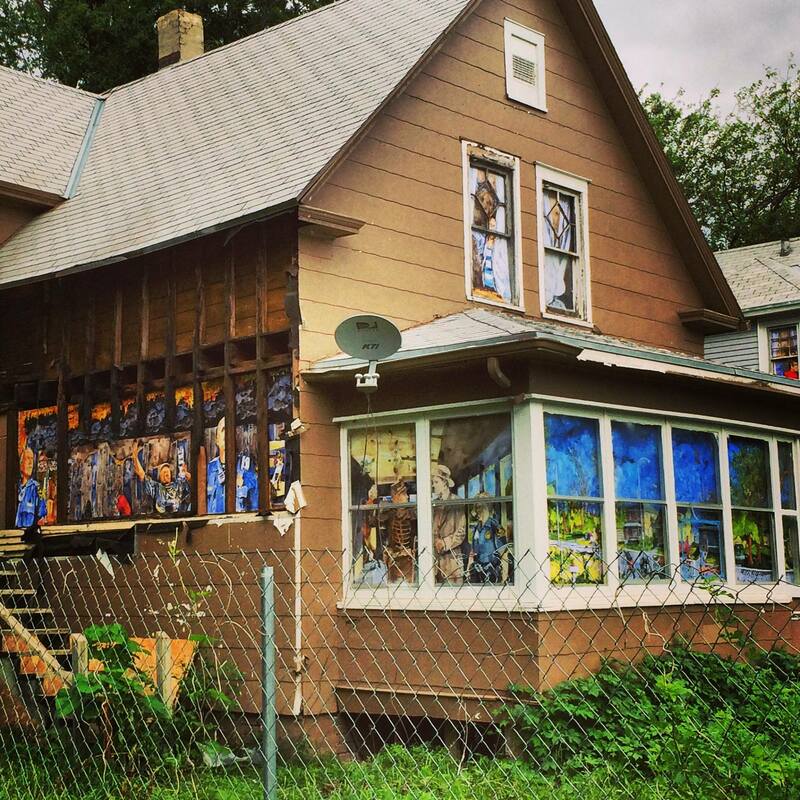 In Image A we see a rundown house with missing siding and covered windows. The yard is unkempt and bordered by steel fencing. It sits on a very small land plot squeezed between the other houses of the crowded South Omaha neighborhoods. There are no driveways or paved parking spots visible. In Image B we see many large houses made up of three stories. Each property is rather large, complete with a driveway that has room for multiple cars. Though borders aren’t very distinct from the view of the picture, there is enough space between the houses to distinguish one property from another. The landscaping is very manicured and uniform, representing the higher property value and income of the home owners. In Image C, we see a house in a North Omaha neighborhood that is rather small with an unkempt yard with no landscaping,a nearly destroyed driveway, and an old van parked on the side of the house in the grass. The garage is separate from the house and there is caution tape that appears to run from the back yard to the neighbor’s property. Houses are very close together as they are in South Omaha and the neighborhood appears to be neglected of maintenance. Image C clearly reflects the poverty of this neighborhood. In Image A we can see the strong influence of Hispanic culture with the shop and restaurant signs in Spanish and banners displaying decorated boots which are a big part of Mexican fashion specifically. The area is full of small crowded shops, reflecting the appearance of the heavily crowded neighborhoods in this part of Omaha. It can be concluded that above the business area there are also apartments. This in some ways symbolizes the non distinction of business and leisure. This ties into the whole stereotype that hispanic restaurants/stores are run and owned by the whole family. In Image B the buildings are more presentable and have a welcoming atmosphere. The large, clear windows give a sense of openness to this strip of businesses. There is vibrant landscaping and a distinct color scheme for the plaza contributing to the well kept and organized appearance of the area. In Image C we have a business on a rather empty street corner in North Omaha. There is little landscaping and a very dull and gloomy feel with there being little color present. There is a mural on the side of this business featuring all African American figures, most likely because they are the most apparent group in the area. The mural also features a cop car, symbolizing the heavy crime rates in the area. There is very little that is inviting about this business district with no apparent signs, little color, and no parking lot. In Image A, there is a soccer game going on between South and Millard North High School. An interesting observation of this event is that, there is a clear distinction in the major ethnic groups that are a part of each team. Such as, South (team in red) has a majority of hispanic teens. This is analogous to the stereotype that hispanics are either “better equipped/skilled” for soccer or even that soccer is overall enjoyed in hispanic culture. This concept of identity within a sport is similar to how most Americans largely identify themselves to a favorite American football team. Here in this image, it can be observed that there is some sort of band practice going on. The main significance of this picture appearing first that satisfied the category of an “event” is the fact that the majority of those in the group are caucasian and from Millard West. Nonetheless, while the setting of this picture may not be of much importance, however it does show the type of accessibility that certain schools especially in areas around Omaha have better sport fields. This last image depicted a historical event that occurred in North Omaha. 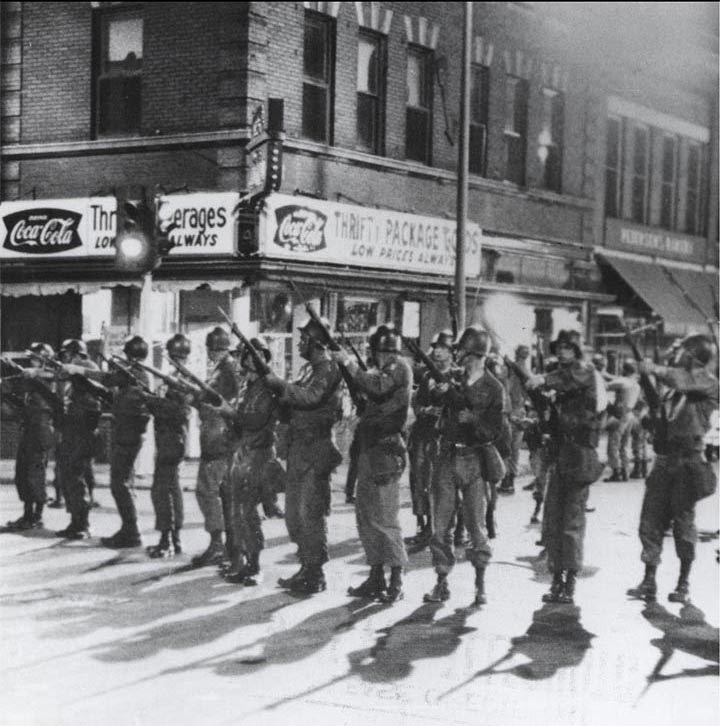 This was taken during a riot that pertained to the civil rights movement at that time. It became such an uproar that the national guards were involved. Though this picture is the outlier compared to the “school event” pictures that “South and West Omaha” search gave. This is significant because of the ties built on civil rights that originate in the African American community. Which is why such an event even occurred due to the immense participation of those in North Omaha (where African American population is densest). The idea that our project presents is that Omaha is generally divided by race. The Northern area of Omaha being dominantly African Americans, South Omaha being mostly Hispanic Americans, and the majority of West Omaha being non-Hispanic whites. We see this to be true in the coded map above. With neighborhood segregation comes stereotypes about each region. Typically neighborhoods dominated by minorities are associated with higher crime rates, lower levels of education, and lower income. While these may just be assumptions they are statistically accurate for the city of Omaha. Point2homes website has collected demographics of each area of Omaha. They set the national average for total crime risk at 100. In comparison, South Omaha’s rate for total crime risk was 201 and North Omaha’s rate at 198, both well above average. While West Omaha was hardly above average sitting at 108. Here we can see that these areas with more appearance of minorities are actually at a higher risk for crime. Average household income and level of education help to support the generalization we’ve made about these areas also. Income and level of education are somewhat correlated and our statistics definitely support this idea. The numbers for no high school education in Omaha are as follows: South Omaha- 7,856, North Omaha- 3,096, West Omaha- 897. On the other hand, we have the numbers for those with a Graduate level degree at 9,736 for South Omaha, 6,208 for North Omaha, and 13,236 for West Omaha. These are most likely directly related to the average household income which is $56,067 for South Omaha, $52,369 for North Omaha, and $87,859 for West Omaha. These are factors that could drive people toward or away from specific areas. Common mechanisms contributing to the process of residential segregation are the pursuit of higher property value, fear of crime, and fear of social heterogeneity (Vesselinov, 2008). This is apparent in West Omaha where gated communities are present more so than other areas of the city. In gated communities, elected boards oversee the common property and make restrictions and legal residential contracts that basically exclude potential buyers of certain race, ethnicity, or income. (Vesselinov, 2008) This is why we see mostly caucasian americans occupying the Western portion of Omaha. Businesses also reflect the segregation of the city. Ethnic specific businesses arise from areas that have a denser ethnic population (Fong, 2008). This in turn is the reason for the success of those businesses because they are centered in the area populated by the targeted consumers. The whole idea of self-identity leading to self-segregation due to cultural differences has been confirmed for the city of Omaha, Nebraska.